It isn't rocket science except when it is, indeed, Rocket Science. This renowned group of improvising superheroes delivers an audacious take on electric- acoustic chamber music. Rocket Science is a quartet assembled by trumpeter Peter Evans, who is probably best known for his work in the disobedient quartet Mostly Other People Do The Killing. He also leads a trio, quartet, quintet, and octet and can often be heard in the company of Mary Halvorson, Nate Wooley, Mats Gustafsson, and Agusti Fernandez. Evans also regularly performs solo. His extended technique brings new sounds and a 'beyond-category' approach to his instrument. Just the man for saxophonist Evan Parker's Electro-Acoustic Ensemble, which can swell to over two dozen players. 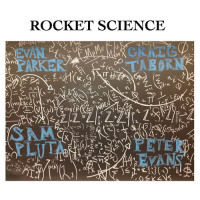 Evans pares down Parker's ensemble to just four players, adding pianist Craig Tabornwho played on Parker's Transatlantic Art Ensemble recording Boustrophedon (ECM, 2008)and Sam Pluta a composer, laptop improviser, and sound artist. Evans has recorded several discs with Pluta, their finest release being Ghosts (More Is More, 2011). With a unit like Rocket Science, Evan Parker (who is approaching 70) can finally realize his improvising conception of real time electronic processing, improvisation, and extended technique. This, their inaugural release, was recorded in 2012 at the Vortex Jazz Club in London. The sound is presented with no overdubs or edits, and the quartet falls into a comfortable, yet restless sound. The agitation works to the ensemble's advantage throughout. Parker's fluttered notes graze, abrade, and seduce the intimate and intricate piano playing Taborn, the same sound the like of which he revealed on his solo disc Avenging Angel (ECM, 2011). Next to Parker sits Evans, who is perhaps the trumpet equivalent to Parker's saxophone. Both have developed (Parker over forty years, Evan just ten) a distinctive signature sound that is beyond the jazz idiom. The wildcard here is Pluta, who stealthily (in real time) manipulates sound, adds some buzz, vibrations, and the whirl of a hard drive. The quartet engages in a variety of sound, emotion, and tension release. A fine debut for a very promising ensemble.